visiting a lodge | Osceola Lodge # 515 F&A.M. You want to find directions to the Lodge? This will make it easy!!! If no member can vouch for you, the Tyler will arrange for a committee to meet with you in the Examining Room, to verify your Dues Card and claims that you are a Mason. You should be able to easily verify Masonic membership if you remember some basic items from the 3 degrees that you recieved. 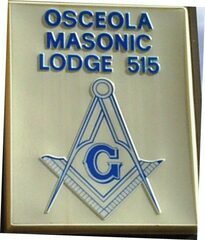 When Visiting Osceola Lodge 515 and you are a member of our Lodge, examinations generally are not required, as it is highly likely that a member present has sat with you at one time or another in our lodge. 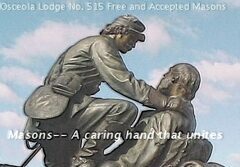 Be sure that a current dues card is in your posession when ever you visit a lodge--Even your Own! For those brethren who have difficulty with steps or have a physical condition that limits or prohibits stair climbing, we have a chair lift that will bring you up and down to our Lodge room with comfort and Safety!! Osceola Lodge No 515 will provide courtesy aprons for members and visitors, but you are most welcome to wear your own lodge’s traditional formal Masonic dress when visiting our lodge.